Now in its 17th year of publication, That Patchwork Place's quilt calendar has become a favorite of quilters worldwide. Show off a love of quilting year-round and enjoy sewing along each month too: the calendar spotlights 12 dazzling, front-page-worthy projects plus a 28-page pullout booklet that includes complete directions for making each one.Chosen from recent best-selling Martingale books, featured quilts come from much-loved designers including Kim Diehl, Pat Sloan, Laurie Simpson, and Bonnie Olaveson. Whether it graces the kitchen, office, or sewing room, this perennial favorite is perfect for ringing in a brand-new year with gorgeous quilts. - This perennial favorite is perfect for ringing in a brand-new year with gorgeous quilts. 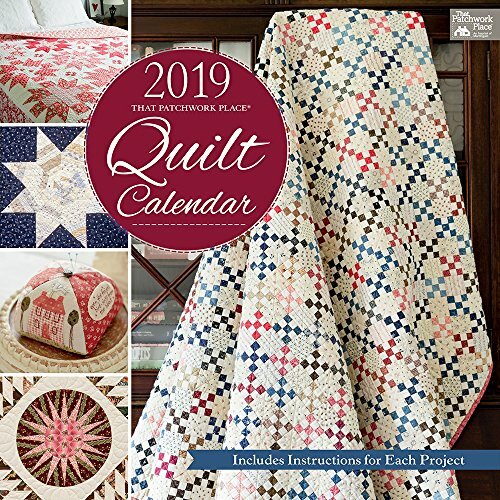 - That Patchwork Place Calendars Quilt 2019- 12 dazzling, front-page-worthy projects plus a 28-page pullout booklet that includes complete directions for making each one. - Chosen from recent best-selling books from popular designers including Kim Diehl, Pat Sloan, Laurie Simpson, Bonnie Olaveson, and more.